Indulge in the fanciful romance portrayed in this Large Filigree Crystal Cameo Cocktail Ring . 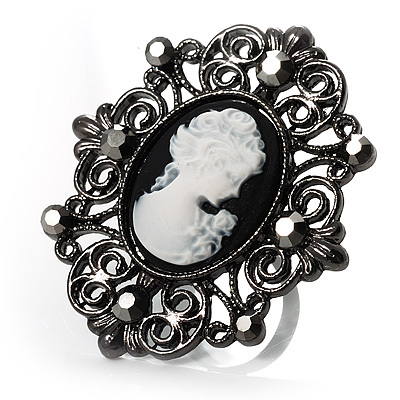 Featuring a handcarved profile of a young lady, crafted in black tone finish metal, decorated with filigree and crystal detailing, adding a unique touch to the ring. The head measures about 50mm x 45mm, tapers towards the shank to 3mm. Perfect fashion jewellery for the party season and a beautiful gift.